Two new smartphones , the Intex Cloud Y7 and Y13 has been listed on the company’s official website with coming soon Tag. Both the handset comes with 4 inch display and are powered by dual core chipset. The Intex Y 7 Cloud has 2G support while the Cloud Y 13 comes with 3G network support. 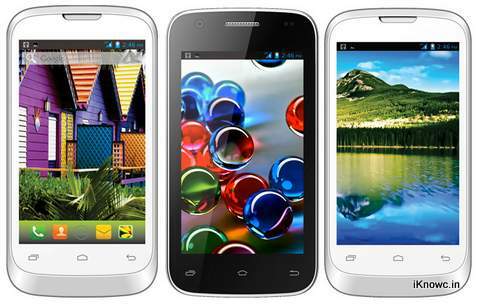 Intex has included there own apps to make the handset more approachable for Indian users. The Cloud-Y7 has 4 inch WVGA display , 1.0GHz dual core CPU based on Mt6572 chip and Android v4.2.2 OS. It has dual Sim support and packs with a 3.2 MP camera with Flash and a 1.3MP front shooter. It has 512MB of RAM, 512 MB of ROM and further expandability via micro SD card up to 32 GB. The new Cloud-Y13 features a 4 inch WVGA display, 1.2GHz dual core CPU and runs on Android 4.2 OS. It also offers dual Sim access and houses a 3.2MP rear and 1.3 MP front imager. It has 512 MB of RAM and 4GB on board storage. The has 3G radio support. The Intex Y7 comes in white color and is priced under Rs 5550, however the exact price of the phone is not known yet. The Intex Cloud Y13 is already on sale on Ebay India for a price of RS 5,749. source. how to un lock the spice smart floedge mi-349?